The weather in Houston has been somewhat typical for 21st-century April around here. Winter is generally over, but about once a week we’re getting serious cold fronts coming through on the coattails of spectacular thunderstorms. They wake us from slumber then rock us back to sleep, and in the morning we have to dig our coats back out for the morning commute. A day or two later, perhaps after what feels like one last fire in the fireplace, there’s not a cloud in the sky and the temps are trending warmish, the breezes feel glorious, and I’m excited about our weather for just a little while. I try to savor these days. Sometimes I go out dressed not quite warmly enough just so I can appreciate the cold one last time before the heat sets in. Come summer, it will oh it will. I think the gardening industry is going to have to create a new zone for us. I don’t think zone 9 or 10 really can capture how it gets here in July and August. dark in the crisp ground. coffee tastes good in our mouths. certain as the will to survive. Carol Louise Munn teaches Creative Writing to adults at the Women’s Institute of Houston after a long career of teaching English and Creative Writing in schools and universities both in the U.S. and in Spain. She earned her MFA at the University of Michigan where she won an Academy of American Poets prize. She has been published in Poetry, Mutabilis Press, Houston Poetry Anthology, and other literary journals, and she presents Creative Writing workshops in several schools in Houston. Holy canoli, my garden is growing. 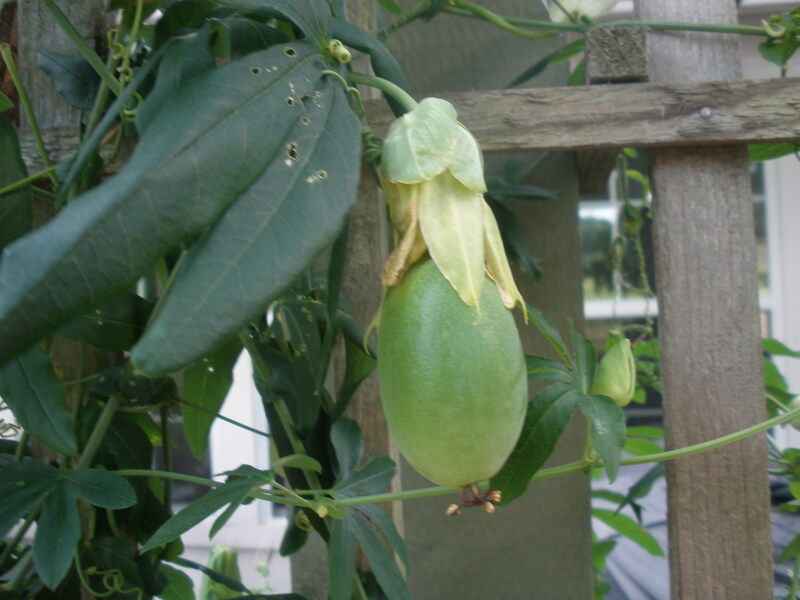 I have found the answer to whether my passion flower vine is one which will produce fruit. Hang on a second…is that what I think it is? 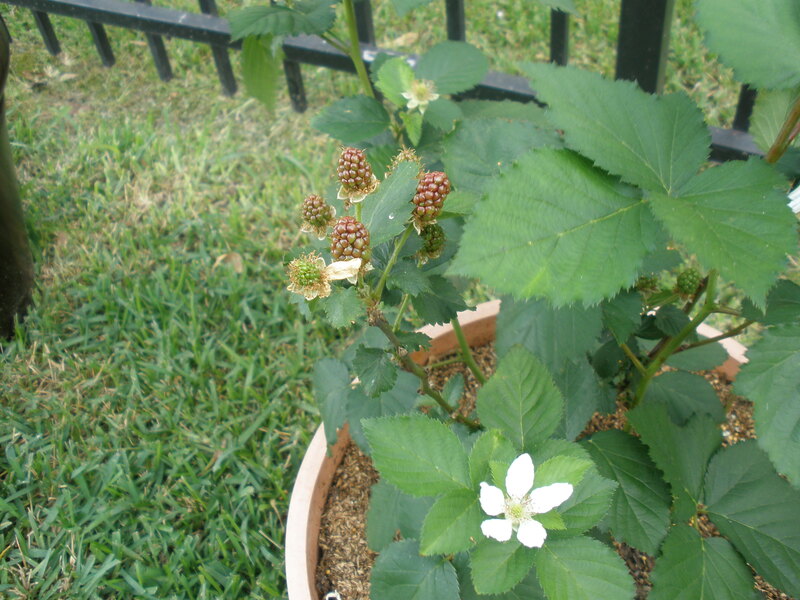 It is apparently producing fruit right now! I went out there this weekend to check on things — I hadn’t in a while; April has been busier than usual this year — and I actually squealed with delight! Check that out! And there are LOTS of them, in various sizes, all over the vine! But then I was mollified by the blackberry bush, which has replaced many of its lovely white blossoms WITH BLACKBERRIES! Woo-hoo! My Saturday morning just kept getting better. Now if I could just grow and harvest those before the wildlife finds them, I’ll be a happy little gardener. But I know how things go, and it’s going to be a game of chicken. Fortunately, that stupid fig tree which was supposed to be sugar figs but which is actually a variety of fruit I can’t stand, and which has (against all odds and my own spiteful neglect) thrived for years, producing three harvest seasons annually, is close to the other fruit plants and is much larger, so maybe the critters will gorge themselves on tingly green figs and leave all the good stuff for the humans wot planted it. 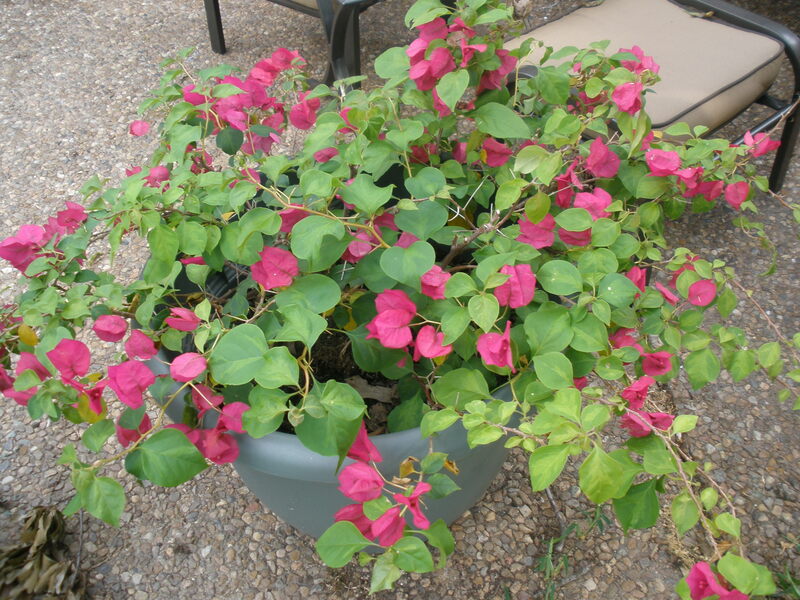 The bougainvillea I repotted from the little hanging baskets seems to be doing well. Nice. Well, nice enough for now. It gets better. 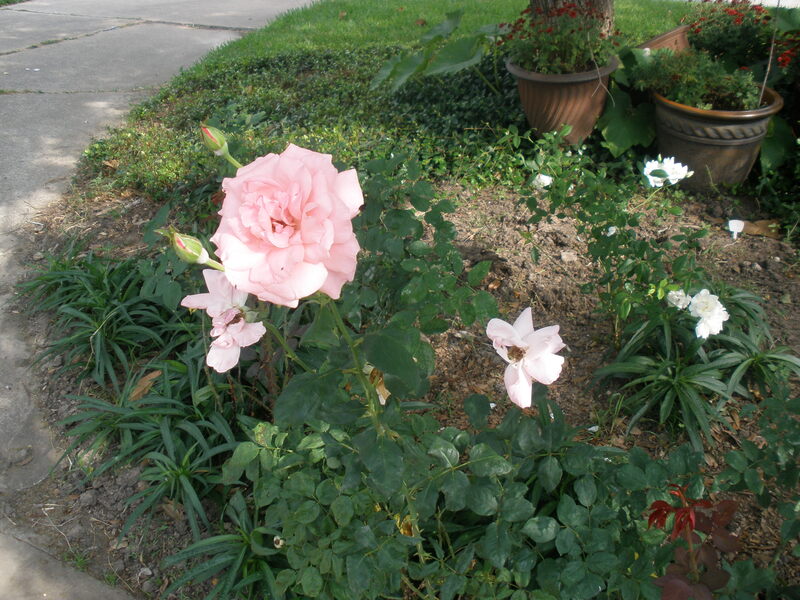 The roses are coming up…well, you know. This rosebush got real tall real fast. 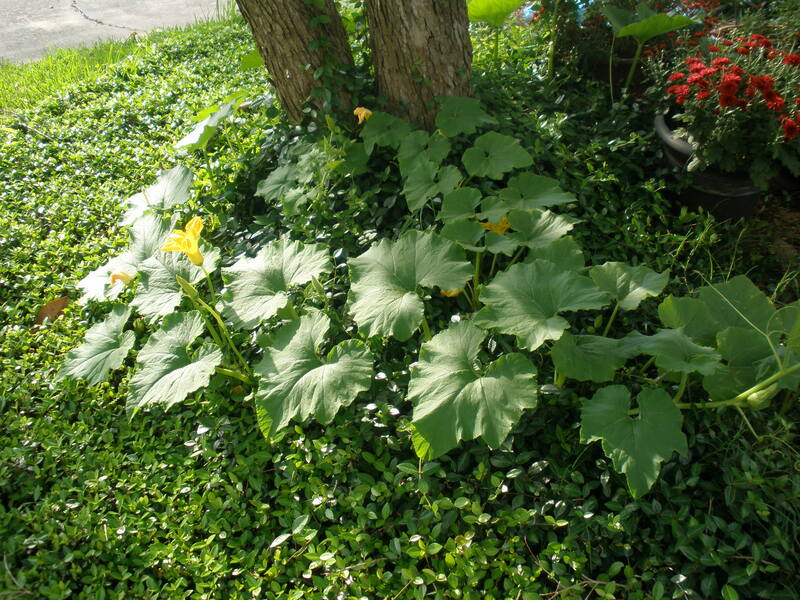 And that exotic pumpkin vine (or so we assume it is, since it just sort of sprouted spontaneously a few months after our exotic pumpkin display went the way of the ghost) continues to assert its dominance in the space under the Chinese tallow trees. This is just a fraction of its size. It has wrapped around both the trees and the urns between them and is overshadowing that ivy groundcover like no one’s business. Not that I’m complaining! I much prefer pumpkins to ivy. And this squash vine has big, lovely, yellow flowers. 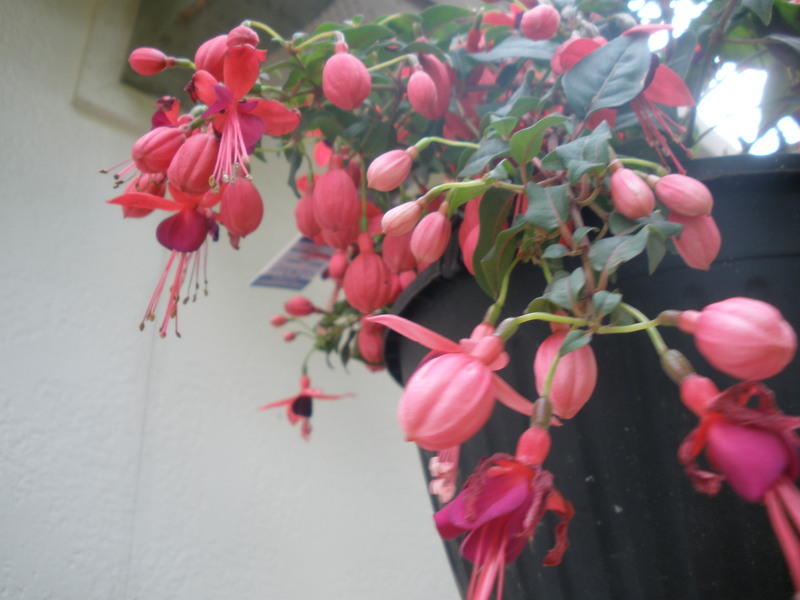 I was so inspired when we dashed out to the garden store Saturday afternoon, I actually bought a pot of fuschias on a whim, just because they looked cool. I actually had no idea what these were but thought they looked interesting. They apparently attract hummingbirds, always a good thing. I got them home, and good heavens, they like SHADE! How could I be so lucky? Maybe this spring and summer the garden will thrive, thrive, thrive. 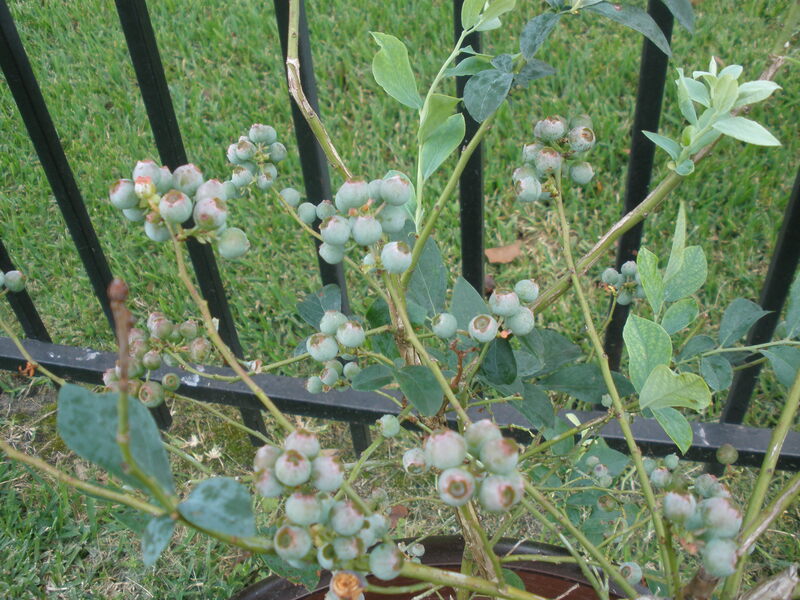 Did I mention we have blueberries too? Anyone know when they’re supposed to ripen? Hope springs eternal. Especially when you keep it watered and weeded and fertilized properly. Ah there, Salvador! It is, once again, springtime. In my part of Texas, that means the sky is the kind of scrubbed-clean electric blue that comes with being freshly washed by rain, and everything else is green or magenta. Oleanders and azaleas and roses adorn the yards of conscientious homeowners everywhere, and the birds and butterflies and bees are like gods in bliss. The twin Chinese tallow trees in my front yard tower over everything with an expansive canopy. In the autumn, their foliage turns fire-engine red, almost overnight, down to the last tender leaf; within a few weeks, their limbs stick out bare, stretched over a carpet of fading crimson. But now it is March, and their branches once again flaunt a soft flutter of continually multiplying green, each deep lime cluster crowned with a pale orange flourish of new growth. 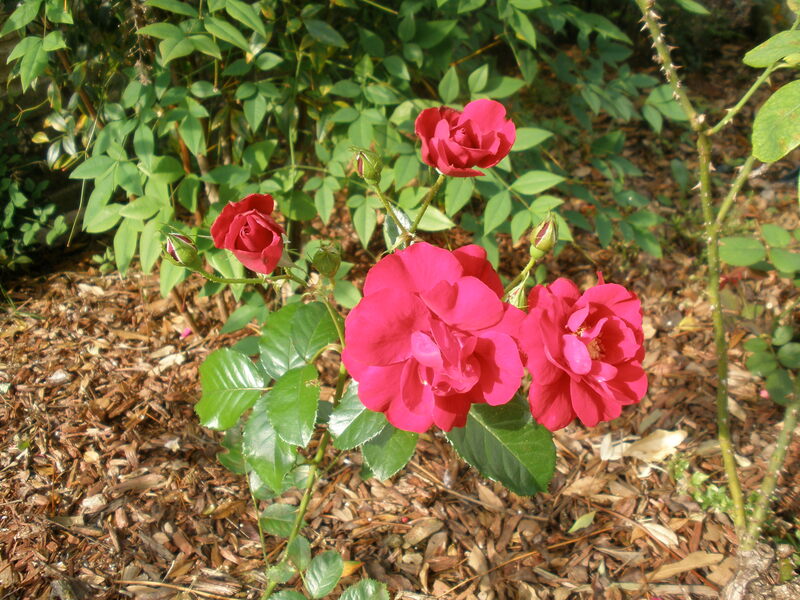 Beneath the trees, fledgling rosebushes sprout floribundas basking in the sunlight the tree has not yet blocked. The ivy groundcover could use a trim. And a hardy and rapidly burgeoning new vine suggests that, back in the fall, one of our decorative pumpkins must have split open and dropped some opportunistic seeds into the soil without our notice. You may have read my post a couple of months back about my love-hate relationship with my garden. Back then, zero-scaping seemed like a viable and reasonable option, but I resisted. Instead I pruned and weeded and nourished and watered and tried very hard to make a go of it, once more. And what do I have to show for it now? O glory! 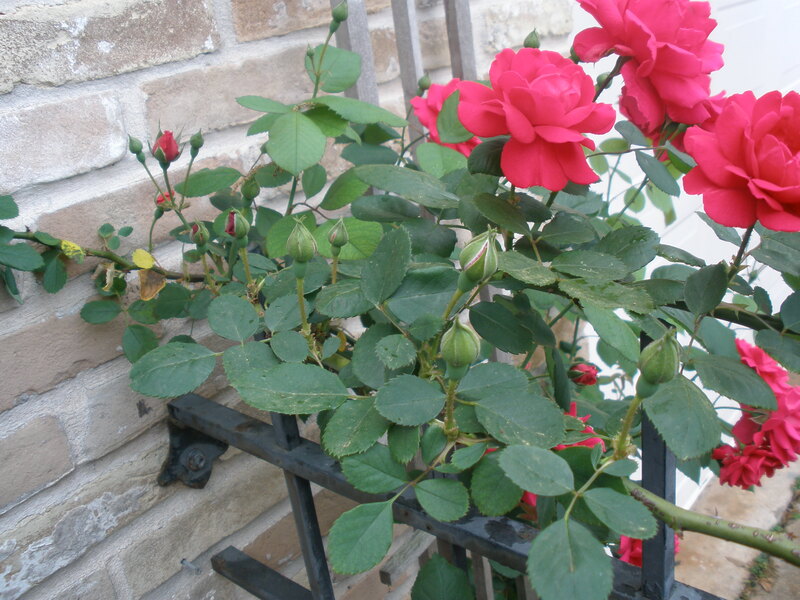 The climbing rose vine has bloomed! And look! There will be more roses to come! 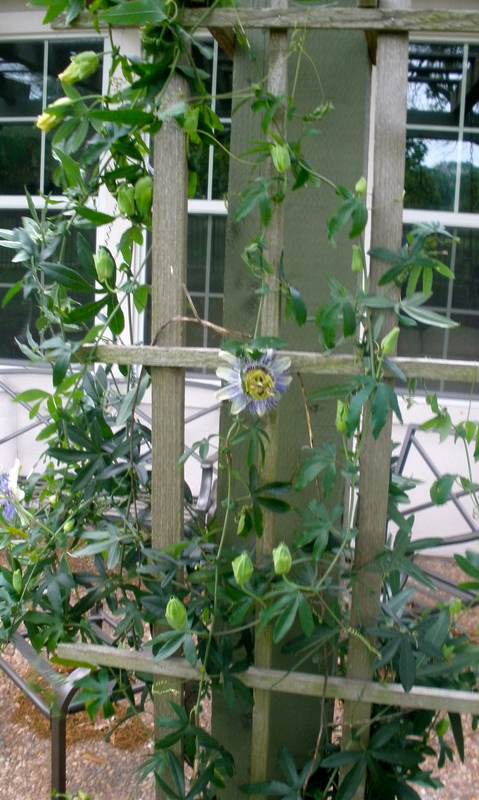 The passion flower vine I planted in a euphoric delirium of optimism late last summer has managed to survive the drought and wrapped its capillary tendrils around everything within reach, including a potted bougainvillea. 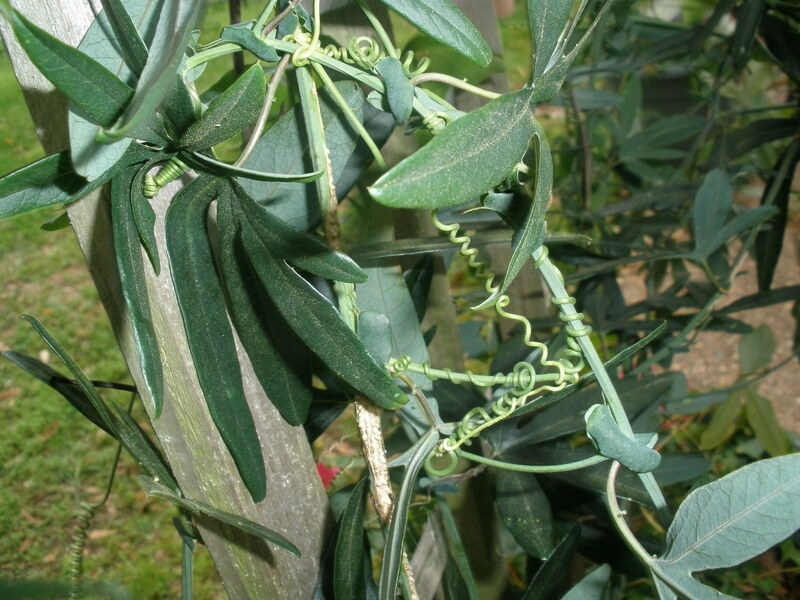 Its tender tendrils have snuggled up like boa constrictors to everything within reach. 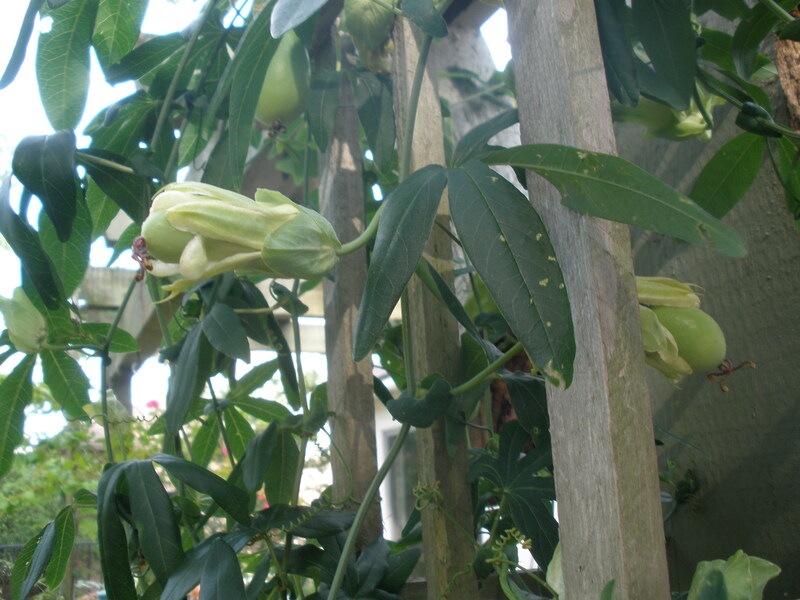 If you look carefully, you will see one of the actual passion flowers. One of the hanging baskets containing another bougainvillea has taken on a roommate, a flourishing strawberry stalk that must have hived off one of the two strawberry plants that were temporarily housed in the same corner of the patio. Strange bedfellows, no doubt, but they’re both thriving so well I’m a little skittish about a transplant yet. I’ve even gone so far as to drive down to the local garden center in a heady flush of hope and load up my car with fruit plants — two plum trees loaded with petite white blossoms, a blackberry bush, and a blueberry shrub advertised as being ideal for warm climes and already heavy with tiny gray-green fruits. Folly? Setting myself up for failure? It is possible. But right now, while the exquisite weather encourages me to spend more time out of doors than in, while I’m not yet used to the extra hours of daylight that surprise me like a gift each lengthening afternoon, I am simply going to water them all, and hope for the best. I have a love-hate relationship with my garden. In fact, to call it a “garden” feels a bit grandiose. It’s more appropriate to call it a collection of seemingly randomly placed plants and flower beds anchoring the edges of my front lawn. Moreover, calling my relationship with it “love-hate” is probably more generous and optimistic than the situation deserves. I love the idea of having a garden. However, what I really want is a gorgeous refuge of healthy plant life that calls to mind the best quality of a traditional English garden: an idealized image of nature. I want lots of colorful flowers against a deep green backdrop, roses and dahlias and hydrangeas with butterfly weed and tall double hollyhock in supporting roles. I want a groundcover of whatever those charming purple blooms are that persist in growing in the shady parts of my yard that no one seems to be able to identify or sell me more of, but which are blessedly bereft of excessive weeds. I want purple crepe myrtle and blue jacaranda trees, and deep magenta bougainvillea that blooms heavily all year. I want the kind of fruit trees and vines that produce things I like to eat. And I want my homeowners’ association to leave me alone about my yard. It is possible I want too much. 1. My work schedule changes so that I am actually at home during the daylight hours for most of the year, and not completely worn out when I get there, a to-do list a mile long awaiting me. 2. I acquire an exceptionally talented gardener for my birthday. 3. The position of my house changes so that it no longer blocks all the sunlight from reaching the garden spaces on my property. 4. I move to another house which already has this perfect garden and a caretaker to maintain it. 5. I move to someplace other than what appears to probably be zone 9 or 10. 6. I am suddenly transported into an actual fairy tale. Unfortunately, as it turns out, each of those six scenarios just might be equally likely to happen. So what’s a girl with a black thumb to do? I have tried. I have made honest efforts. I have read books on gardening for my specific plants and for my specific area. I have investigated related websites and spoken with people from the local rose growers’ association and consultants at independent nurseries. I have planted in locations which seem to get enough sunlight. I have watered diligently and for long enough, according to expert opinions and directions, when there wasn’t enough rain. I have pulled weeds. I have pruned. And for these pains, I have been repeatedly disappointed, even to the point of having to occasionally do deep pruning – you know, with a shovel. My front lawn and flower beds have been landscaped, or at least planted, a few times, sometimes by myself and my husband, sometimes by my mother-in-law (“Surprise! Happy Birthday!”), sometimes by professional lawn care services and even, once, an outdoor space designer. Yet things always fall apart due to the weather or my inability to maintain the place when I go four or five days in a row without getting home from work before dusk. I can’t really control either of those things. Sometimes I’ve bought plants that, despite their marketing, won’t grow in our zone. Sometimes the problem is with the soil in my yard, and I don’t identify the true problem or how to fix it until it’s too late. Sometimes the fruit tree I buy and then plant and then wait exuberantly for the fruit to grow ends up being the wrong variety, which was mislabeled when I bought it – for example, not sugar figs but some weird fig I end up being allergic to. 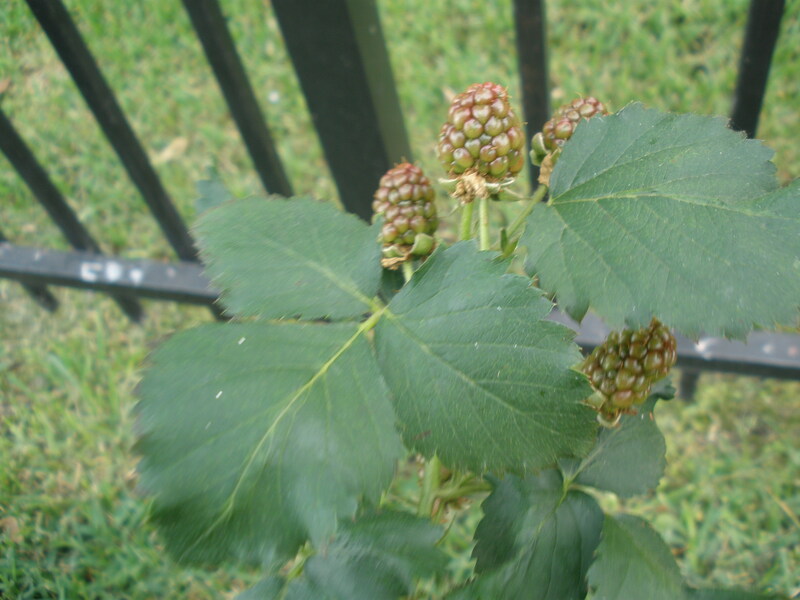 And then that’s the plant that thrives and and has three successful blooming seasons a year! Ultimately I’m left feeling demoralized. So it’s January again, which in my area means it’s time to prune and begin thinking about what to do with the space next. I must have indomitable spirit, because I’ve actually been brainstorming with my husband some ideas for what to do with these stubborn garden spaces. 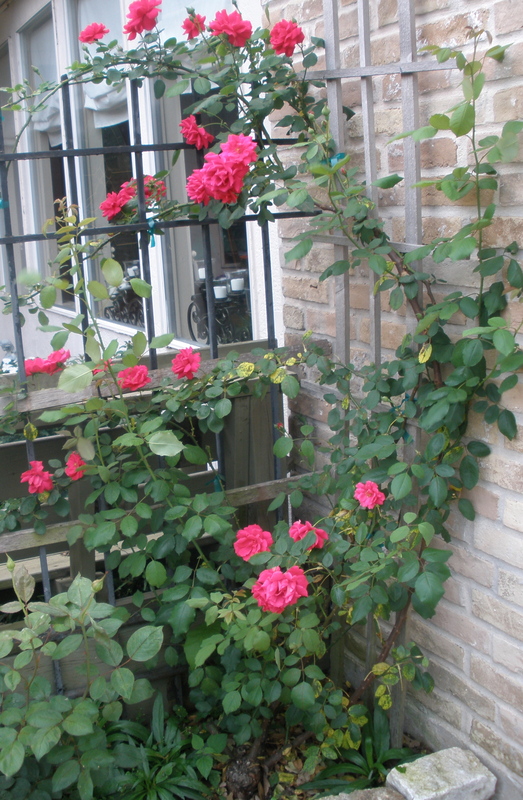 It will begin with cutting back the roses, again, both the bushes and the climbing vines. And pulling out the weeds, which spitefully and tauntingly thrive, thrive, thrive. And perhaps purchasing some soaking hoses to make the job easier. After that? Well, sigh. It’s anyone’s guess. 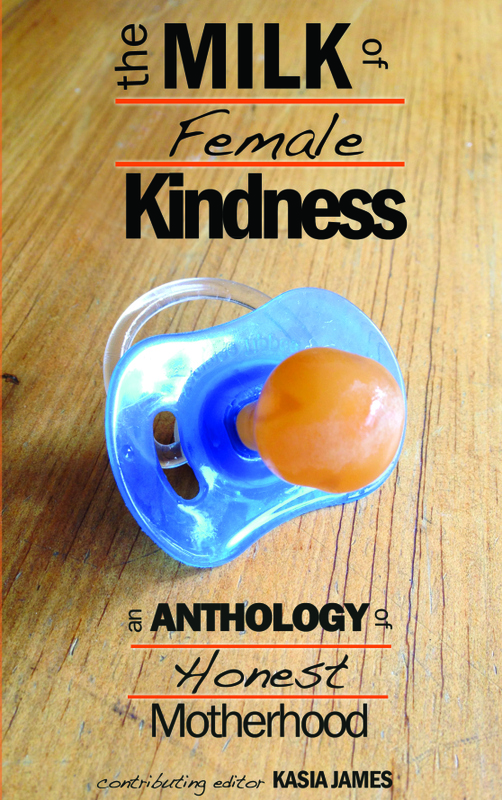 This essay has been removed because an updated version of it appears in THE MILK OF FEMALE KINDNESS: AN ANTHOLOGY OF HONEST MOTHERHOOD, along with the writings and artwork of others on the theme of motherhood. Click here to purchase the anthology from Amazon, or contact me directly at forest.of.diamonds@gmail.com for a signed copy.